ASUS Republic of Gamers (ROG) today introduces its latest lineup of gaming laptops at CES® 2019, including the ROG Mothership, ROG Zephyrus S GX701, ROG Zephyrus S GX531, ROG Strix SCAR II, and ROG Strix Hero II. All have graphics powered by the latest NVidia GeForce RTX engines. This full top-to-bottom lineup is filled with updates that elevate your portable PC gaming experience across a diverse family of form factors from the ultra-slim Zephyrus S to the innovative GZ700 Mothership. More than just vehicles for the latest GPU, ROG’s NVIDIA GeForce RTX lineup showcases our commitment to enhancing every aspect of gaming laptops. They feature incredibly fast displays framed by amazingly slim bezels, amplifying immersion to draw you deeper into your favorite games. Advanced cooling ensures maximum performance with minimal acoustics and lets you choose between system profiles tuned for different scenarios. Add cutting-edge components and exclusive ROG features, and you have the right foundation for a full family that stands apart from the rest. Putting high-end gaming components into an ultra-slim laptop is exceedingly difficult, especially when targeting a thinner chassis than ever before, but the Zephyrus S GX531 delivers with a remarkably compact body that’s a testament to ROG’s engineering prowess. The slender exterior measures nearly 15mm thin and leverages a 15.6” display with super-narrow bezels to squeeze into a smaller footprint, so you can easily stuff the system into bags made for laptops with much less power. Instead of highlighting the WASD cluster, translucent key caps impart an extra glow to the QWER row. The Hero is available exclusively with GeForce RTX 2060 graphics that are more than up to the task of pushing high frame rates in MOBAs and other popular games. Like with the SCAR II, NVIDIA Optimus technology conserves power by only activating the discrete GPU when needed, so you get longer battery life day to day and better gaming performance on demand. NVIDIA’s Turing architecture augments familiar CUDA cores for programmable shading with RT cores for ray tracing and Tensor cores for AI acceleration. These hardware resources enable developers to create more realistic real-time effects that make lighting, shadows, and reflections more lifelike than ever before. Even without next-gen eye candy taking advantage of their varied cores, NVIDIA GeForce RTX GPUs set a new standard for gaming and VR performance for portable PCs. While the GPU generates frames, the display is responsible for completing the experience by putting them in front of your eyes. That’s why we work closely with panel providers to develop screens that meet our exacting standards and push the industry forward. All of our NVIDIA GeForce RTX gaming laptops are available with high-refresh 144Hz panels capable of delivering true triple-digit frame rates. Grey-to-grey response times of just 3ms minimize ghosting and blurring to produce a crystal-clear view that helps you see every detail when the action gets heavy. Gaming laptops typically make the user choose between the smoother experience of NVIDIA G-SYNC™ and the longer battery life possible with NVIDIA’s Optimus™ tech, which intelligently deactivates the GPU to save power as needed; you can have a machine with one or the other but not both. However, the ROG G703 adds a unique GPU switch that lets the same system go between G-SYNC mode for gaming and Optimus mode for better battery life. All it takes is a few clicks and a reboot. Coffee Lake CPUs with up to six cores and 12 threads complement the lineup’s graphics prowess with plenty general-purpose processing power. These 8th Generation Intel® Core™ processors combine the high clocks required for maximum gaming performance with the additional cores needed to tackle heavy multitasking and demanding workloads that go beyond gaming. System profiles tune performance and acoustics for different situations; Turbo mode opens the taps for maximum speed on demand, Silent mode dials back to lower noise levels for lighter loads, and balanced mode hits the sweet spot for serious gaming. Switching between modes is as easy as pressing a shortcut key. Effective cooling is critical whether you’re blasting baddies during an epic gaming marathon or loading up the CPU with video rendering and other intensive tasks. This is especially true for gaming notebooks with limited internal space for heatsinks and fans. The cramped quarters inside laptop chassis require clever engineering and attention to every little detail. All of our NVIDIA GeForce RTX laptops employ dual 12V fans capable of moving more air at higher RPMs than their 5V counterparts. The housings incorporate anti-dust tunnels that catch particles and direct them out of the back, which prevents buildup on the heatsinks that could otherwise compromise long-term performance and stability. Desktop-style keyboard layouts make our RTX series more familiar for players who go back and forth between their battlestation at home and a gaming laptop on the road. Separated blocks of function keys are easier to find, and the larger spacebar provides a bigger target for your thumb. Key presses fire faster thanks to Overstroke technology, which actuates earlier in the travel for a quicker response while also extending the post-actuation distance to improve typing feel. Anti-ghosting tech ensures that each press registers precisely, even if you’re mashing multiple keys at once. DDR4 system memory is standard equipment across the board, and all models can be configured with wicked-fast NVMe SSDs. Intel Gigabit Wi-Fi is also integrated from top to bottom, enabling greater-than-gigabit speeds with compatible 802.11ac Wave 2 routers like the ROG Rapture GT-AC5300. ROG RangeBoost technology uses pairs of antennas to improve signal strength and extend range. WiFi antennas work best in a specific orientation, so we carefully position multiple antennas to cover each other’s dead spots. RangeBoost constantly scans your surroundings and intelligently shifts between antennas to sustain the strongest signal. Smart amplification closely monitors the speakers to prevent them from exceeding temperature and excursion thresholds. Users can crank the volume without damaging the cones and enjoy louder output with less distortion. Headsets plug in via standard 3.5-mm audio jacks or a selection of USB ports in Type-A and reversible Type-C flavors. Our Sonic Studio III software simulates surround sound for stereo devices, and you can apply it and other effects to a wide range of devices that includes headphones, speakers, USB DACs, and VR headsets. 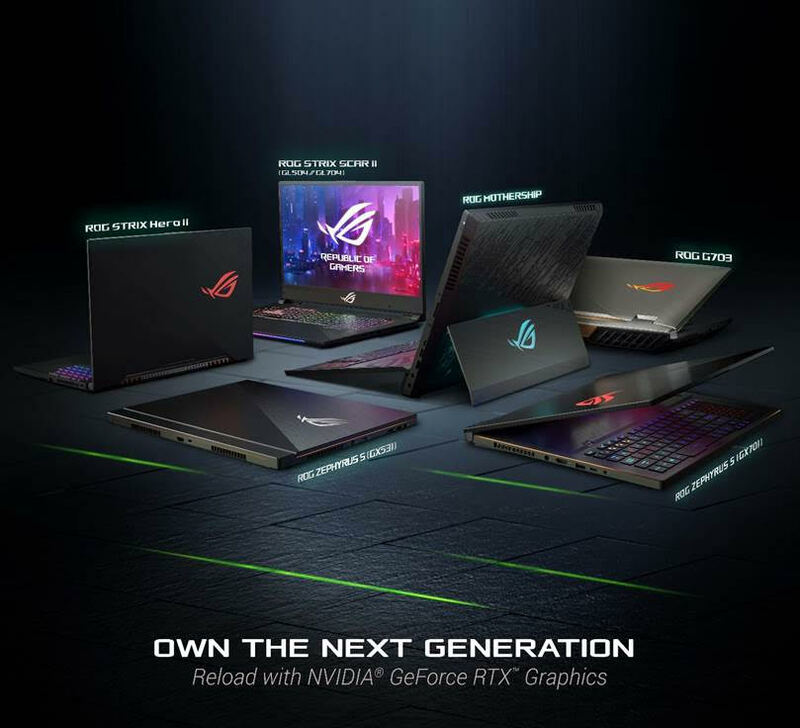 Republic of Gamers’ new NVIDIA GeForce RTX-based gaming notebooks will become available in Q1. Local pricing, configurations, and availability to follow.